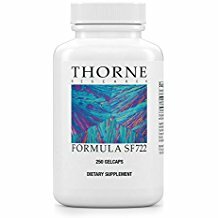 Sf722 for yeast most active ingredient is undecylenic acid that is extracted from castor bean oil. It is an eleven-carbon, mono-unsaturated fatty acid and also occurs naturally in the body's perspiration. Undecylenic acid is approximately six times more effective as an anti-fungal than caprylic acid extracted from coconut oil and is helpful in maintaining a healthy balance of intestinal and vaginal flora. In 1945 Wyss BJ, et al. discovered anti fungistatic and fungicidal action of fatty acids and related compounds, undecylenic acid was one of those compounds. Arch Intern Med 1954;93:53-60. In 1954 Neuhauser I. demonstrated that it can successfully treat intestinal candida yeast infections. Arch Intern Med 1954;93:53-60. It inhibits yeast from converting to the mycelial form we know as candida. McLain N, Ascanio R, Baker C, et al. Undecylenic acid inhibits morphogenesis of Candida albicans. Antimicrob Agents Chemother 2000;44:2873-2875. This helps prevent the formation of candida biofilms. Steven S, Hofemyer JHS. Effects of ehtnaol, octanoic and decanoic acids on fermentation and the passive influx of protons through out the plasma membrane of Saccharomyces cerevisiae. Appl Microbiol Biotechnol 1993;38:356-363. It has been shown to be effective in preventing fungal overgrowth associated with vaginal and gastrointestinal candidiasis via its fungicidal activity. Miles MR, Olsen L, Rogers A. Recurrent vaginal candidiasis. JAMA 1977;238:1836-1837. During lactation, oral administration of sf722 for yeast to nursing mothers can prevent thrush in babies and is useful for the treatment of breast yeast infections. It also inhibits oral candidiasis or thrush in adults and tests have shown it to completely inhibit the growth of denture stomatitis. It is still used today for fungal infections of the skin in Desinex cream commonly used for skin yeast caused by Candida albicans, Trichophyton species, Epidermophyton inguinale, and Microsporum audouini. Undecyclenic acid has a long history of safety and is approved by the FDA for the treatment of fungal infections. It is best to take it in capsule form because of the bad taste and possible irritation of the mucous membranes. Get SF722 or Undecyn for Yeast Infections Here. Any questions or concerns about Sf722 for yeast infections or Undecyclenic acid, please feel free to contact me. 1. Shapiro AL, Rothman S. Undecylenic acid in the treatment of dermatomycoses. Arch Dermatol Syphilol 1945;52:166-171. 2. Peck SM, Rosenfeld H. The effects of hydrogen ion concentration, fatty acids and vitamin C on the growth of fungi. J Invest Dermatol 1938;1:237-265. 3. Chretien JH, Esswein JG, Sharpe LM, et al. Efficacy of undecylenic acid-zinc undecylenate powder in culture positive tinea pedis. Int J Dermatol 1980;19:51-54. 4. Barrie SA. Comprehensive Digestive Stool Analysis; In: Pizzorno JE, Murray MT, eds. A Textbook of Natural Medicine. Seattle: JBC Press, 1986: II: CDSA-1-4. 5. Prince HN. Effect of pH on the antifungal activity of undecylenic acid and its calcium salt. J Bacteriol 1959;78:788-791. 6.Bourne N, Ireland J, Stanberry LR, Bernstein DI. Effect of undecylenic acid as a topical microbicide against genital herpes infection in mice and guinea pigs. Antiviral Res 1999;40:139-144.